Spiked ‘Wellness’ Cocktails Are on the Rise — But Are They Actually Healthier? If the start of 2019’s health trends could be summed up in two words, it would be “monetizing wellness.” Everyone is stressed — approximately 80 percent of Americans — and everyone wants to throw money at their problems. Alcohol has long been acknowledged as a socially acceptable form of stress-relief, but it’s not very Goop-y to sip on a tall-can of PBR. The good news? You can still maintain a semblance of a balanced, yogini lifestyle with new beverage options such as CBD-spiked cocktails. In addition to an addiction to wellness, Americans can’t seem to get enough booze, particularly women. In fact, alcoholism among women in the U.S. increased by 83.7 percent between 2002 and 2013. Plus, there’s a growing thirst for craft cocktails. In the U.S., it’s a $44 billion industry that’s predicted to grow to $58 billion by 2022; that’s a six percent increase every year. As usual, millennials are being cited as the driving impetus behind this trend: They consume 32 percent of spirits alone, and this is anticipated to increase as millennials work their way up the corporate ladder. In short: Millennial women don’t want to drink dad’s boring “lite” beer. They have a thirst for the artisanal, and it can be deliciously delivered in a cocktail priced in the double-digits. This pairing of wellness and booze has led to cocktails such as gin-infused “matcha blossoms,” algae and chaga mushroom cocktails, and even kale ginger daiquiris. Plus, an increasing number of liquor companies are crafting “organic” booze, such as a quinoa-based vodka infused with antioxidant powerhouse goji berries. Let’s get the first question out of the way: Are these options actually healthier? The short answer is no, said Dr. Sara Gottfried MD, a three-time New York Times bestselling author; her latest book is Brain Body Diet. On top of raising cortisol levels and reducing the quality of your sleep, alcohol can also impact your waistline by causing your liver to burn alcohol for fuel instead of burning fat in your body, Gottfried said. This may slow down your rate of fat burning by more than half. And it doesn’t stop there. That being said, there may be a way to create a balance. Egler suggests steering clear of wheat-based alcohols such as whiskey, ryes, and scotch, and opting instead for “cleaner” choices like tequila, vodka and mescal. He also encourages adding ingredients such as aloe, burdock, cayenne, dandelion root, dill, ginger, horseradish, parsley, peppermint, rosemary, saffron and turmeric. 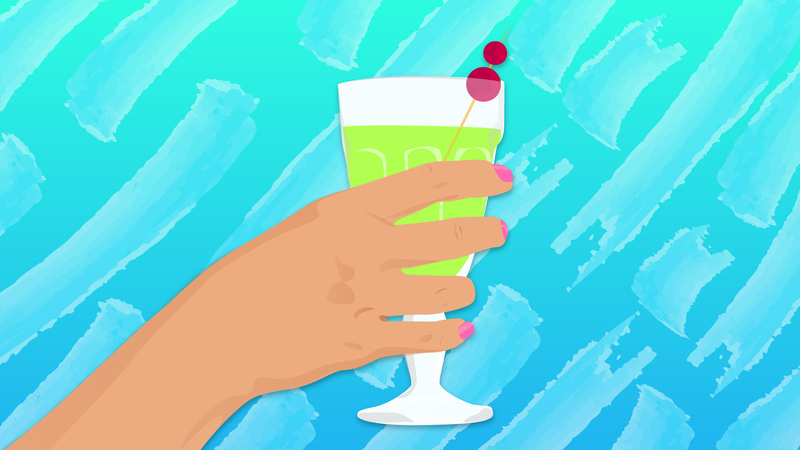 Ariane Resnick, CNC, author of The Thinking Girl’s Guide to Drinking: (Cocktails Without Regrets), agrees that while you can’t necessarily cure an ailment with a cocktail, consumers can make smarter choices when hitting the bars. Again, this doesn’t mean you should be slamming ginger-infused Moscow Mules night after night. When it comes to consumption patterns, limit your intake to two servings per week—that’s approximately 12 ounces of beer, five ounces of wine, or 1.5 ounces of 80-proof spirits, such as vodka or tequila. Alcohol may never be the panacea we all want it to be. Life isn’t all about perpetual betterment, though. Sometimes you just want a cocktail for the sake of, well, drinking a cocktail. Just make sure you’re consuming responsibly and for the right reasons, said Gottfried. Plus, it’s all about moderation—and plenty of water paired with your wellness cocktail.